Artists’ Reception – Friday, October 6 at 5:30 p.m.
An artist’s reception is scheduled for 5:30 – 7:30 p.m. Friday, Oct. 6. This event is free and open to the public. Light refreshments will be served. Gallery Talk – Thursday, October 26 at 2 p.m.
A Gallery Talk starting at 2 p.m. Thursday, Oct. 26 will be held in the Renee Foosaner Education Center’s Frits Van Eeden Gallery. Space is limited. The gallery talk is free and open to the public. 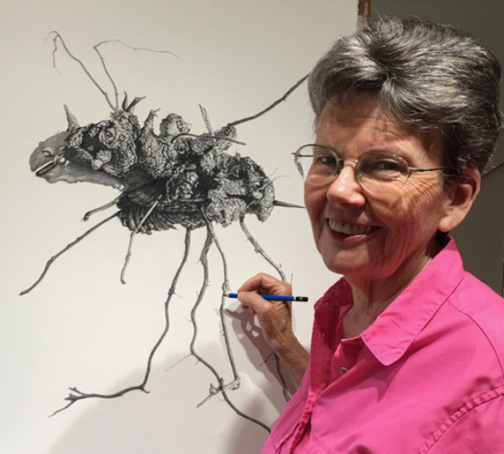 Nancy Dillen, a Florida native, has been a local art educator for 35 years. She has had her paintings exhibited in museums and galleries throughout the United States and Canada and has many permanent pieces in Melbourne, Vero, and Orlando. As a painter, Nancy’s landscapes reflect the two worlds in which she lives, the real and imaginary.